From 87th Ave: Enter Social Alley through the doors between the Butterdome and the PAWS facility. Walk north through Social Alley and turn right into the Van Vliet East hallway. Follow the signage to take the elevator to the fourth floor and turn right. The Human Neurophysiology Laboratory is found on the second set of doors on the right. From the Students' Union Building: Enter Social Alley through the doors across from the Students' Union Building. Walk south through Social Alley past the Sports Hall of Fame and turn left into the Van Vliet East hallway. Follow the signage to take the elevator to the fourth floor and turn right. The Human Neurophysiology Laboratory is found on the second set of doors on the right. From the Education Car Park: Enter the Van Vliet East building through the doors on the northern end of the outdoor parking lot. Walk through the building and find the elevator on the left. Take the elevator to the fourth floor and turn right. The Human Neurophysiology Laboratory is found on the second set of doors on the right. 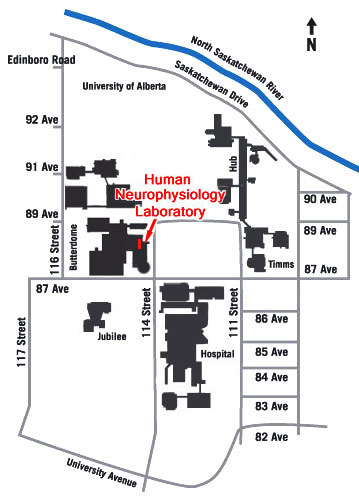 Dr. Collins' office: Dr. Collins' office is across the hallway from the Human Neurophysiology Laboratory.